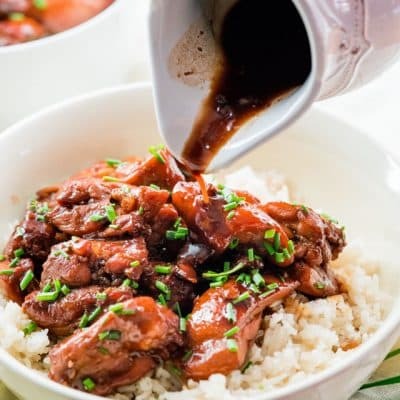 This Bourbon Chicken is a flavorful chicken dish where the chicken is marinated in a bourbon and soy sauce marinade. 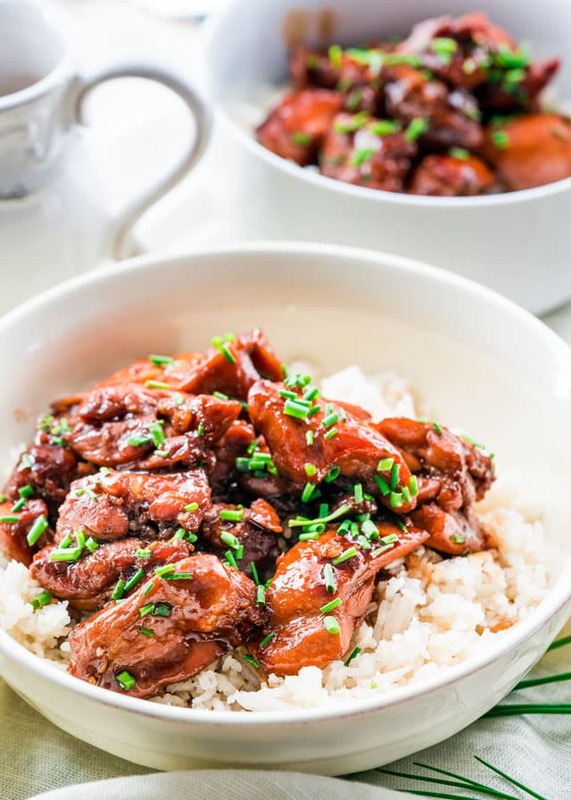 Served over rice, this dish is easy and delicious! 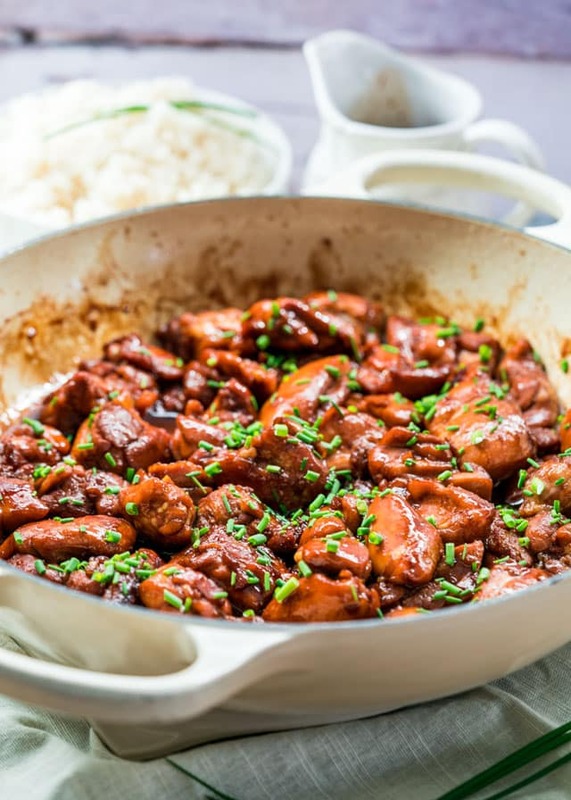 Here’s a recipe I shared with you guys exactly 5 years ago to the day, which I think is crazy, but it’s one of my favorite chicken dishes. 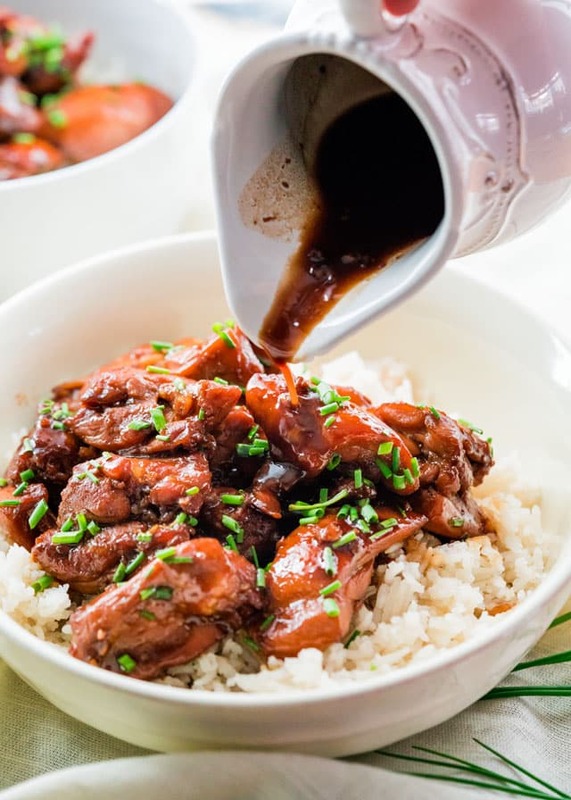 Bourbon chicken was the dish I’d always have whenever we used to go to the mall for a quick lunch. I loved it because it’s so flavorful and the chicken is so juicy and tender. 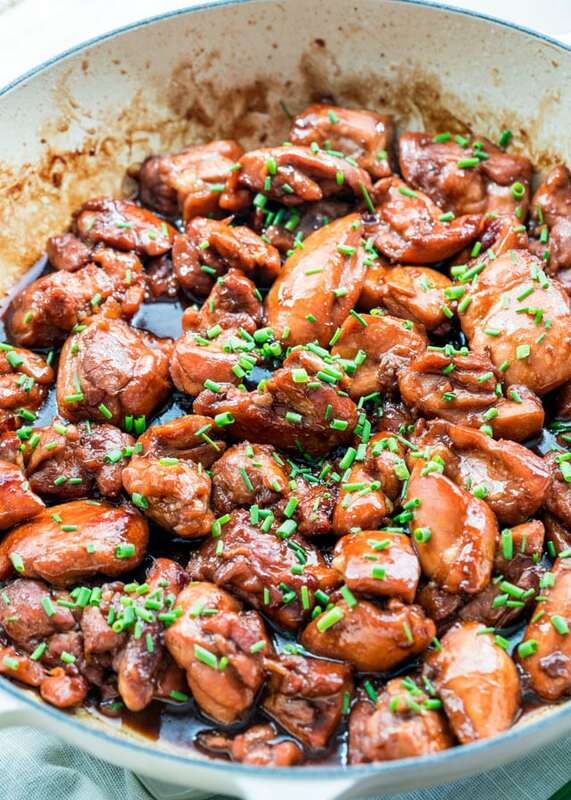 Although I originally thought that Bourbon Chicken was an Asian dish. However, it is actually a Cajun dish in origin named after Bourbon Street in New Orleans. But it doesn’t really matter where it originated. The important thing is that it’s so good and most importantly so easy to prepare. 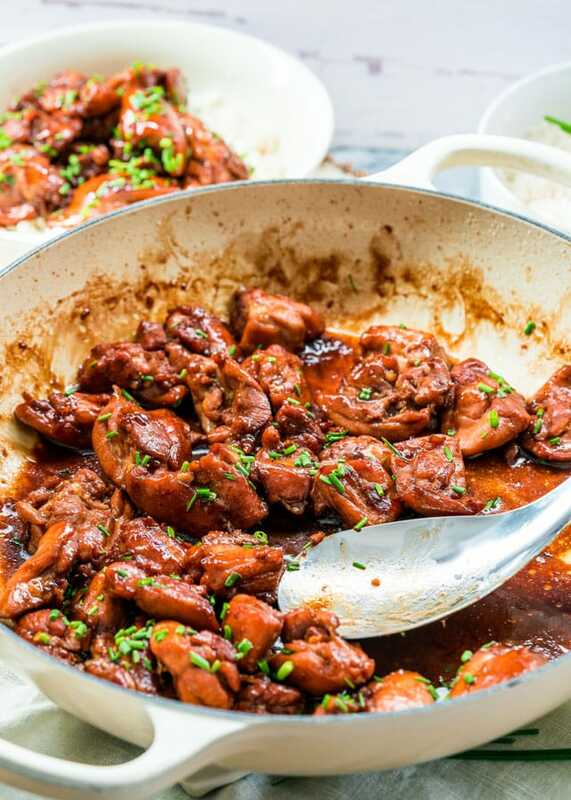 Seriously though, this dish is so simple, the skills required are whisking all the marinade ingredients together and then cooking the chicken. The great thing about this dish is that you can prepare this the night before and just let it marinate overnight. Next day when you come home from work all you have to do is cook the chicken. I do cook the marinade in this dish and as it cooks it reduces creating this nice and sticky sauce that’s to die for. I like to add half of it to my chicken as it cooks and I cook the remaining sauce separately in a small saucepan until it reduces, so that I have some to drizzle over my chicken and rice afterwards. Chicken breast will work for this recipe if you’d like to cut down on the fat content. The first time I shared this recipe with you guys, I had it done with chicken breast. While it was still delicious, I think chicken thighs work way better here because they are juicier. Whiskey, brandy, or scotch would work if you don’t have bourbon. The alcohol evaporates completely during the cooking process, so it’s completely safe for children. If you don’t want to use red wine, try cranberry juice or even some chicken broth instead. I served this over rice, and I think some veggies like green beans, corn or peas, broccoli, even asparagus would go nicely as a side to this. Whisk all the marinade ingredients together in a medium bowl thoroughly. Add the chicken pieces to the bowl, toss them around, cover with plastic wrap and refrigerate for at least 30 minutes to overnight. In a large skillet heat the olive oil over medium to high heat. Add the chicken pieces and cook until the meat is no longer pink, about 5 minutes. Add half the marinade to the chicken and continue cooking until the marinade turns into a thicker sauce and the chicken is fully cooked. Should take another 5 to 10 minutes. If you want some extra sauce, cook the remaining marinade in a small saucepan over medium heat, for about 5 to 10 minutes until it reduces about half and thickens a bit. Serve the chicken over rice and garnish with chives. Chicken breast will work for this recipe if you'd like to cut down on the fat content. Whiskey, brandy, or scotch would work if you don't have bourbon. The alcohol evaporates completely during the cooking process, so it's completely safe for children. If you don't want to use red wine, try cranberry juice or even some chicken broth instead. Like I said in a previous message, I just found your site and I am so excited about it. I hope you don’t mind me asking, but what are some of your followers’ favourite recipes. I will proceed with some of them. Thank you very much. Try these recipes! They always get lots of attention on Jo Cooks.